Danganronpa: Trigger Happy Havoc takes great pride in slowly unravelling its twisted, sadistic narrative. You play as Makoto Naegi, a high school student lucky enough to get accepted to Hope’s Peak Academy, an institution that only the best and brightest are able to attend and all but guarantees success to those who graduate. Within minutes of entering its halls, Makoto blacks out and finds himself locked up with 14 other “Ultimate” students. 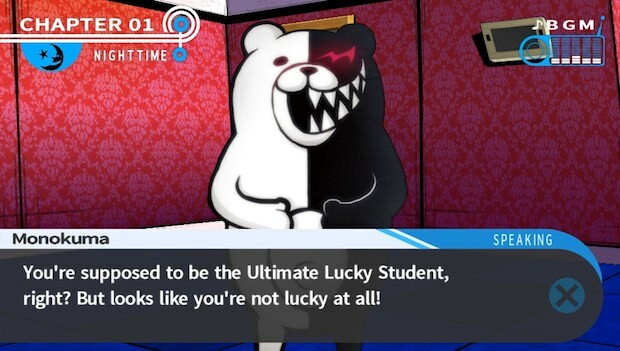 An evil teddy bear named Monokuma appears and informs them that their only path to escape is the murder of their fellow classmates. This is absurd — there’s no way someone would actually want us to kill our own friends. I spoke to my fellow prisoners. Some were understandably standoffish, while others warmed up to me. We began building friendships, despite being trapped inside this flourescent-lit hell. Still, I couldn’t shake that fear that something bad was bound to happen, and a knot formed in the pit of my stomach, as if I’d eaten a bag of gravel. When I found the first victim murdered in my own room, it felt like my entire world had fallen out from beneath me. But it wasn’t the time for mourning — we had to find out who killed our friend, lest they escape and leave us to die in this place. Danganronpa’s narrative unfolds fairly slowly compared to other games — it is a visual novel after all, and you’ll spend a good portion of your time pressing the X button to advance its reams of text. Luckily, the writing is very well done. You’ll quickly find yourself absorbed in its sick world, wanting to discover how everything plays out. The inhabitants of Hope’s Peak Academy are Danganronpa’s greatest strength, and will consistently subvert your expectations. Many Japanese visual novels (like Zero Escape: Virtue’s Last Reward) tend to rely on the same anime tropes to convey its characters. What Danganronpa does is take these tropes and flip them on their head; people you thought you could rely on turn out to have the most evil intentions, and some of the most vile characters end up becoming your most reliable friends. This colorful cast of comrades is much more developed than you’d expect, and will keep you guessing until the very end. Much like its characters, the narrative is also filled with enough twists and turns to fill an entire television series. Each chapter is broken up into two sections. The first consists of wandering the halls, speaking with your friends and spending time with them. It almost feels like a weird dating sim — as you attempt to build friendships by talking to people and giving them gifts, you’ll earn new skills to use in the second half of the chapter. It’s here that the most game-like aspects show up, and it turns into a dark and depraved version of Phoenix Wright. As soon as someone ends up murdered, you’re tasked with exploring the crime scene to find clues. Luckily, Danganronpa rarely feels like a pixel hunt, as you’re usually not allowed to leave an area until you’ve found all the necessary clues, and pressing triangle will show you all the interactive elements in a given scene. Once you’ve found all of the necessary clues, you’re whisked away to the class debate. Here, you’ll use all the evidence at your disposal to rebut your classmates’ arguments. You’re given a series of statements that appear one after the other, and you have to cycle through your list of clues (or Truth Bullets, as they’re known) to effectively make your case. Danganronpa continues to add new wrinkles to these trials — you’ll destroy statement-blocking “White Noise” as you attempt to connect the right clue to the right statement; you’ll shoot a series of floating letters, filling in the proper blanks to reveal a new clue; you’ll partake in a rhythm based mini-game; and you’ll even rearrange manga panels to correctly recreate the crime as it happened. These class trials are strange, unconventional, and are the best part of an already great game. While looking incredibly slick and fun to play, these sections are rarely taxing. Even on the hardest difficulty setting, you’ll never have more than a handful of Truth Bullets to use on a given argument, and as long as you’re able to think somewhat logically, you’ll be able to figure out what you need to do. If you run out of chances on a particular line of questioning and get a game over screen, you’ll end up right back where you left off if you hit continue, rather than being forced to start the whole case over again. Clearly, the developers’ intentions were to facilitate your ability to finish the narrative, rather than get stuck at any particular point. Most of the cases are somewhat obvious on a macro level, as each murder tends to telegraph its solutions fairly heavily. What makes them compelling, however, are the factors that surround each case. The first murder is fairly obvious as to who killed the victim, for example, but the reason why the victim was killed was actually very surprising, and went against all of my expectations for the characters involved. Most surprising of all is that, even after its lengthy, 20-hour-long story, there are still reasons to return. I won’t spoil the surprise, but an additional mode unlocks after you complete the game, and all of the skills and items you unlocked in your first playthrough transfer over into subsequent games, adding a little more life into a game whose genre typically lacks replay value. What makes Danganronpa immensely satisfying is how it consistently toys with your expectations. With excellent writing, well-developed characters, and a story that keeps you guessing, Danganronpa: Trigger Happy Havoc is a bloody good time. Once I’d picked up my Vita, I didn’t want to put it down until I’d discovered all of Hope’s Peak Academy’s horrifying secrets.